GAYYA.ORG is hanging with us today! I’m thrilled today to be hosting one of the co-founders of GAYYA.ORG, a wonderful blog dedicated to LGBTQIA+ young adult literature. I’ve had the pleasure of getting to know Victoria since Caught in the Crossfire released in June, and am very thankful for all her hard work to raise awareness of affirming books. 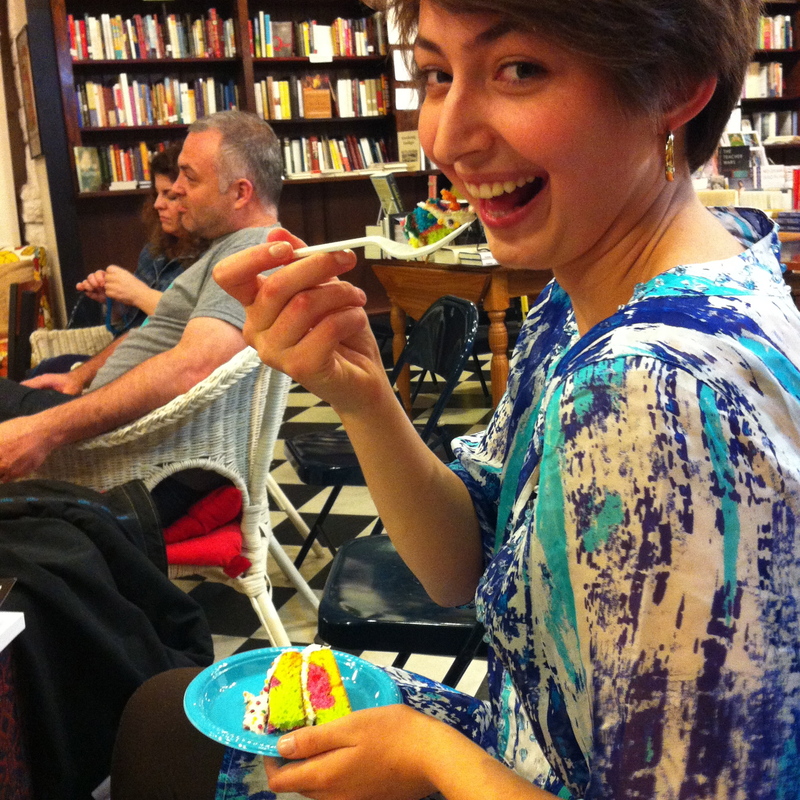 Enjoying a slice of rainbow cake at Juliann Rich & Rachel Gold’s joint launch party! I’m Vee or Victoria, depending on the day. I live in Minnesota. I’m sixteen and homeschooled, currently fascinated by mythology and biology, and doing a lot of writing. I’m a huge fan of actual representation in media. I run GayYA.org with the help of my good friend Kathleen (the first time I wrote this I misspelled that as ‘god’ which I think might be more accurate). You can find me on Twitter @rausicabklvr, and tumblr at vee-signorelli. Growing up, I had two groups of friends. I lived in a super Christian suburb, and had a best friend there. I went to Bible Study, Awana, co-ops, and spent most of my time at my BFF’s house, where God and Jesus and the Bible were discussed regularly. The other group was made up of from the cities, from theatre and the homeschooling co-op I went to. I had really good friends there, too. Because I greatly respected the Christian faith, but also did not believe in God, I was not able to be myself in either group. In 2010 I started questioning my own identity. At the same time, two of my closest friends in the liberal group were coming out as lesbian and the debate on marriage equality was starting up. This debate began chipping away at the polished veneer of love and acceptance the Christians claimed. I began to realize just how anti-gay they were. At the same time, in the cities, and in my Unitarian Universalist church, we talked a lot about marriage equality: we even had these huge chains of colored paper loops stretching from the vaulted ceilings, each loop representing a conversation someone had started. I tended to keep quiet around my Christian friends about marriage, but I posted a lot about marriage equality on Facebook. Maybe, I thought, I could change one person’s mind. Then the father of someone from the Christian group commented on my post about Carrie Underwood (Christian Princess extraordinaire) announcing she was in favor of gay rights. I’ll never forget that moment I read his words. I was in Bibelot, shopping with my sister. I started shaking, and even with people all around us, started crying. He’d went on a tirade, quoting bible passages and spewing hate, saying I was walking down the wrong road, and even though Carrie Underwood was going to Hell, that didn’t mean I should follow her. My sister took me to a bakery to talk through it, then decided it was time to go home. I showed my parents, and they were furious, much more so than I. They couldn’t believe a sixty year old man would say this to a twelve-year-old. I was just shaken—literally. I wish I had saved the comment, so I could look back and deconstruct everything he’d said, but I deleted the entire post. At the same time as this, a rumor was spreading through the Christian community that my best friend and I were gay. I didn’t have any problem with that rumor, because I didn’t think it was accusing me of anything shameful, but my best friend was embarrassed and ashamed. She asked me to stop posting those things, or at least hide them from her grandma, who was apparently getting concerned as well. Things were suddenly weird between us. That was the first time it’d ever happened. That ordeal lead to conversations with my friends and their parents about queer people. I told them why I was so passionate about it (two of my best friends from the liberal group being gay) and they said things like, “well, I don’t judge, but I just don’t think they should be deciding who they’re attracted to so young,” and “well my Uncle is gay, and we’re very close, I love him very much, so please don’t lump us in with the other Christians, BUT,” and “you know, if one of them showed up at my doorstep, I wouldn’t turn them away, because we love everyone. But it’s not my lifestyle, and I wouldn’t take part of it, the same way I wouldn’t go take part in a bar fight.” They just didn’t get it. It was hate the sin, love the sinner mentality 100% percent. Queer people talk a lot about coming out of the closet, but never about the moment we go in. I wasn’t born ashamed and feeling wrong. Those things are taught and learned. And that was when I tucked myself into a closet, away from others, and from myself. Up until then, I didn’t think it would be any big deal if I told people that I thought I was bisexual. I closed off from them, from everyone. That was the first experience I’d ever had like that, talking about my values and beliefs with very adverse people. It was the first time I’d even had a disagreement with my best friend. It shattered me, in ways I’m just realizing now, and even within the other community, I was tucked away. It wasn’t until last year, 2013, that I really allowed myself to explore the possibility of queerness again. Well, “allowed” isn’t quite the right word. By an unforeseen turn of events I was basically forced into it. I became depressed and suicidal, filled with self-loathing and debilitating anxiety. But I got through it. Though I still struggle with those things, I know who I am now, know what I am. And that helps. I’m still not out to most of the people I know, particularly my family (which is amazing to me, given the amount of time I’ve put into running GayYA.org). I still feel the shame around it, the need to hide it, the fear that if I express it I will be attacked. I think I made the right decision at that age. For the “type” of queer I am, I needed unyielding acceptance. But if I’d had Caught in the Crossfire back then, maybe I would’ve been able to look for the accepting people like Jonathan did. Maybe I could’ve cut through the shame instantaneously instead of internalizing it for so long. I lived so long in denial and shame. Although I was involved in the queer rights movement online and read lots of stuff about people in similar situations, everybody seemed to hate the religion and the people in it. I had no way to navigate the situation that I was in. What are you supposed to do when you love the people who are against what you are? How do you even begin to approach that? When rebelling against them, leaving them behind, the way you’ve always seen done, is more painful than staying? The work that Juliann is doing in her books is so unbelievably important. It gives voice to an experience that has been ignored for a very long time. It was too late for me as a guide through it, but it did validate something that no one had been able to understand. And I hope it reaches as many young people as possible, because I know how much it will change them. ← Cover Reveal for TAKING THE STAND! Victoria, I am so happy to have met you. And your sister. And Kathleen. Thank you for being yourself, being honest and being in the midst of all this complexity in a way that is smart and kind and thoughtful. Victoria, you are a beautiful writer and a powerful voice. Just last night I was telling a group of friends about the poem you read at the last open mic and wishing I had a copy of it. Maybe I can get a copy of it…?